Acne is a skin condition which has plugged pores (blackheads and whiteheads), inflamed pimples (pustules), and deeper lumps (nodules). Acne occurs on the face, as well as the neck, chest, back, shoulders and upper arms. 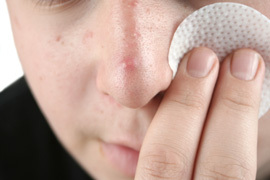 Although most teenagers develop some form of acne, adults in their 20’s-40’s, or even older, can develop acne. Acne can be disfiguring and upsetting to the patient. Untreated acne can leave permanent scars; to avoid scarring, treating acne is important. Treatment: Control of acne is an ongoing process. Existing blemishes must heal on their own and therefore, improvement takes time. If your acne has not improved within 2-3 months, your treatment may need to be changed and a follow-up visit will be necessary.